An unusual window display featuring fossilised crocodile skulls as old as dinosaurs and 300 million year old sea creatures has been stopping foot traffic in Atherton's main street. The rare objects have made their way from the Sahara desert of Africa to The Crystal Caves where their display is attracting much attention. Owner and global collector Rene Boissevain has just released his latest find to the public, and says the genuinely rare fossils are snapped up by collectors worldwide. "These ''Gavial" crocodile skulls are between 65 and 144 million years old, and are very scarce nowadays. The species were the ancestors of the Nile crocodiles, and most disappeared at the time of the dinosaurs at the end of the Cretaceuos period. Unlike modern crocodiles, their diet was exclusively small fish, so their slender snouts were built for speed and maneuverability." Avid collectors of these extremely rare fossilised crocodile skulls like to display their objects of art mounted and carefully backlit in a trophy case created by an interior designer. "Our croc skulls are from Southern Morocco, where we've uncovered a new, exciting supplier who is a well qualified geologist. We purchased four - all that were available - and two of the most outstanding of these are on display at The Crystal Caves," says Rene Boissevain. "Direct importing means we avoid the middlemen, giving us a super competitive pricing structure." As well as the croc skulls, Rene's latest shipment contained some unique tables and bathroom sinks handcarved from slabs of Sahara seabed fossil rock featuring sea creatures and shells over 300 million years old which are also featured in the striking window display. 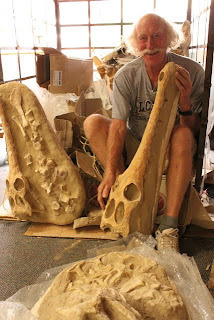 Crystal Caves owner Rene Boissevain unpacks the dinosaur aged crocodile skull fossils.